We are headed to my parents’ house in Milwaukee for the weekend. I’m looking forward to seeing them, even though it’s only been about a month and a half since we last saw them. My mom and I are going shopping (SHE needs clothes), and then she’s taking me to a ballet. Dave is going to hang out with my stepdad, maybe work on some guy-chores and rent a guy-movie. I decided I needed new makeup bags for traveling. I’m not very good at packing when we travel, always bringing too much or ending up with a bag that’s too heavy (so naturally Dave ends up carrying it). 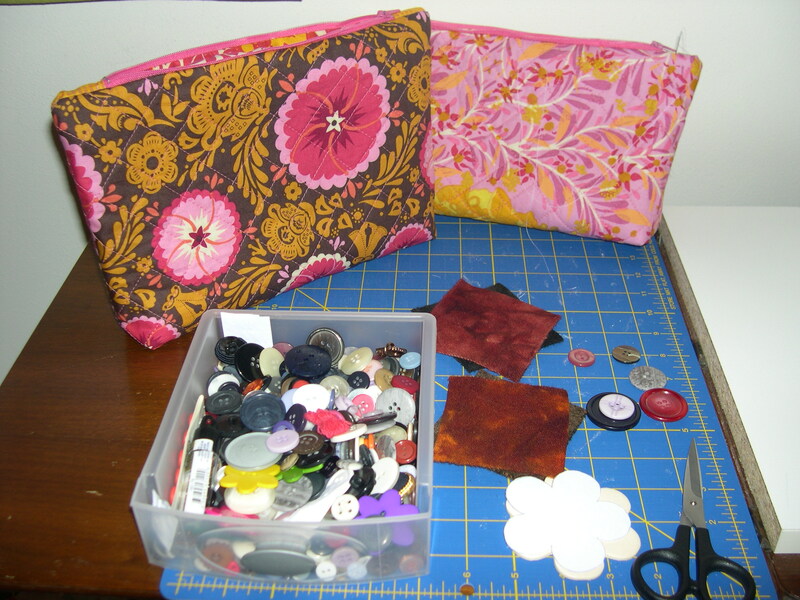 I have several fat quarters of each print from the Good Folks fabric collection in my stash, so I decided to use up some of it for lighter makeup bags than what I’ve been lugging around the past couple years. 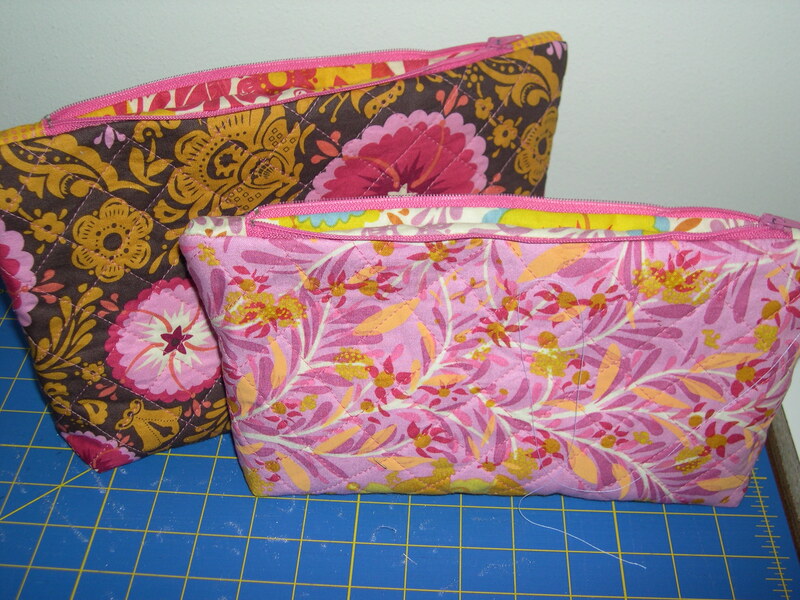 I made these two zippered bags to hold my makeup and toiletries. I didn’t use a pattern, but I knew I wanted them to be fairly big with a flat bottom so they would stand up. I also wanted them quilted but not pieced; just one fabric to show off on the outside and one for the lining. The larger one measures about 7 inches tall by 10 inches wide, and the smaller version is 6 inches tall by 9 inches wide. Hope you all enjoy a grrreat weekend! Love these bags…and the Anna Maria fabrics! Can’t wait for her new line to be available. Have a wonderful weekend! Buttons are never boring! Especially if you are combining them with Good Folks. That is a darling bag set! I hope you have a great week-end, including beautiful weather!! Have a wonderful weekend and enjoy shopping with your mom. Your bags are so sweet, love those fabrics. those are darling bags. I really love those prints, i think it’s time i cave and get some good folks! Since I pretty much just make quilts (and apparently the occasional pillow or coaster), I am very impressed with anyone who can make anything else with fabric — especially involving a ZIPPER (gasp!). Very pretty (and functional) bags. Have a great weekend! Oh my i adore your zipper bag and love the fabrics. 🙂 Hope you’re having a wonderful weekend at Milwaukee! Have a lovely merry happy day and love to you! Hi Terri! 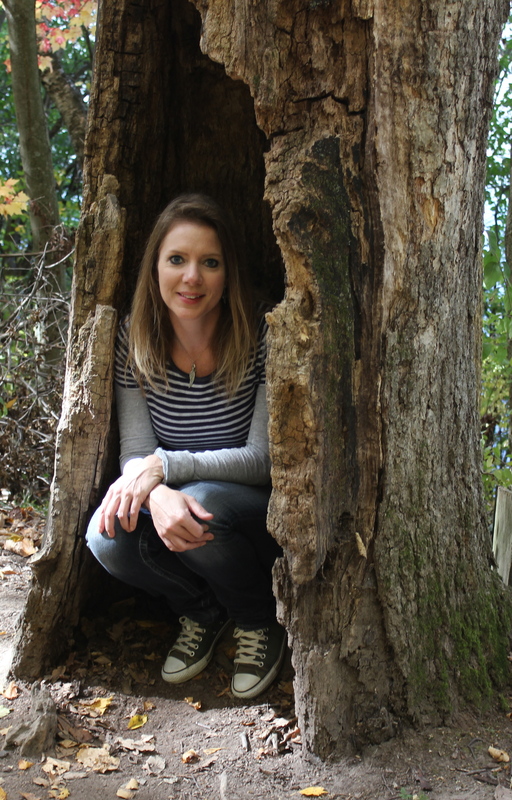 I hope your weekend was wonderful! I love the bags, they came out great! Terri, those bags are so cute, way to go! How was the ballet? Wow, love these bags and the great fabaric combinations. Ooops, I hate typos so I must correct myself. Typing too fast here. I meant “fabric” combinations, but you already knew that-lol. What gorgeous make up bags Terri!! I haven’t used my Good Folks fabric yet – we seem to have the same taste in fabric. 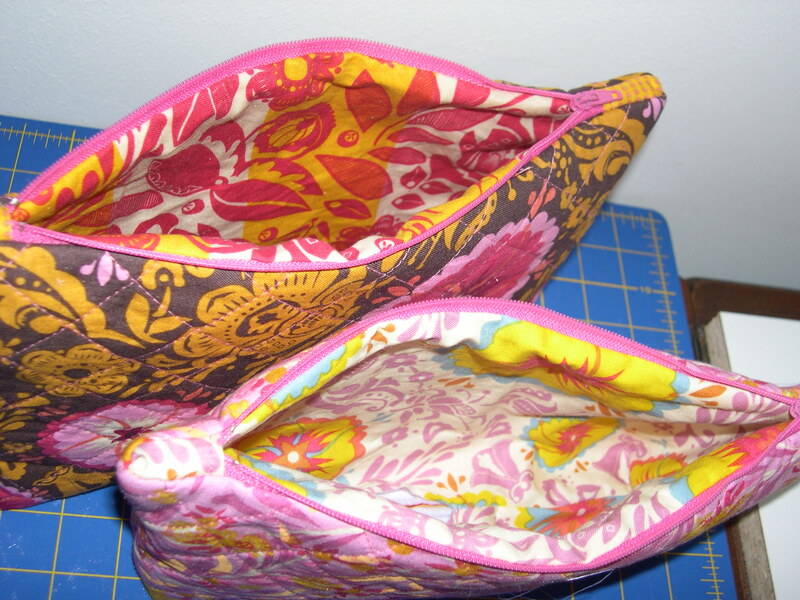 Hey babydoll loving all your projects, the good folks cosmetic bags are awesome! !